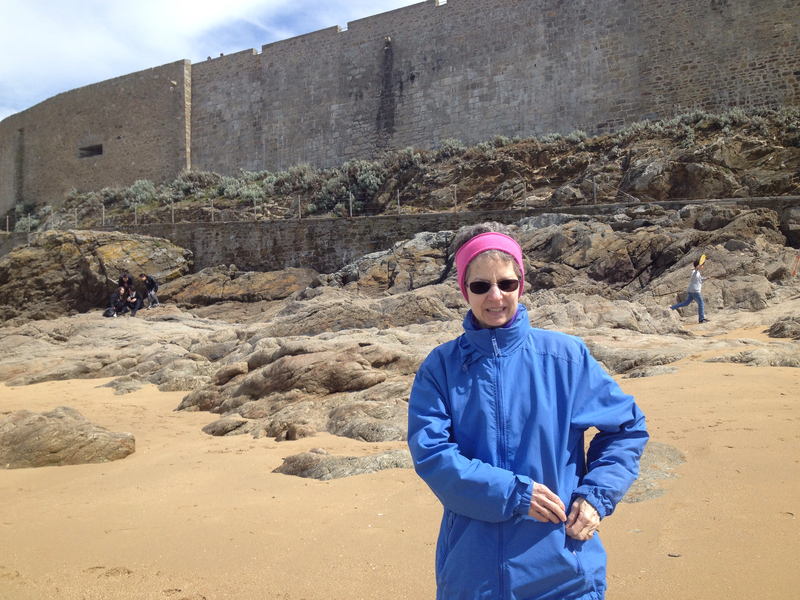 Today is April 13 and in Saint-Malo we had a few surprises. A beautiful day, nice and sunny with temperatures in the mid-60s F / 16 C.
We had a nice surprise early this morning as were having breakfast. There was a soft knock on the door. It was our friend Alain. He had come over to check on the apartment on the 4th floor (5th floor in the USA). It belongs to his relatives and he has been keeping an eye on it while they are in Paris. Alain did not have time for a coffee, but we had a nice talk and we look forward to his next visit. We decided to have lunch at the La Pie Qui Boit. Sandy had been looking at the menu and decided she would like to try a salad that is on the menu. 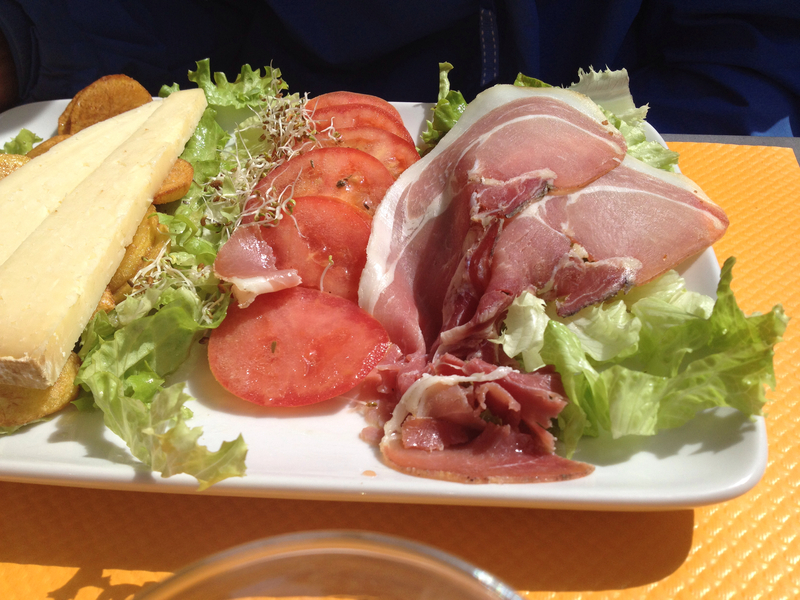 The salad was called “Salade du Pays du Cantal” and it had green salad, cured ham, cantal cheese, tomatoes, and fried potatoes. 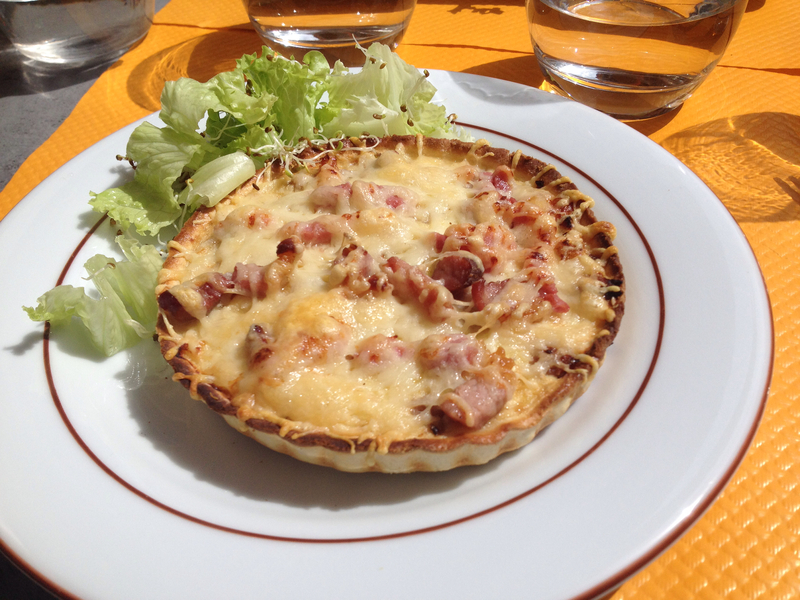 Phil chose Quiche Lorraine and french fries. Everything was delicious. For dessert we shared a crepe with Nutella and banana jam inside it. After lunch we went to the post office to purchase some stamps and mail a letter to the USA. Then on to the beach to walk in the sand and venture into the waves with our wading boots. The boots have come in very handy. We get to mess around on the beach without worrying about getting our shoes wet. Plus the water is very cold, so the boots allow us to walk in the waves and not freeze our feet. 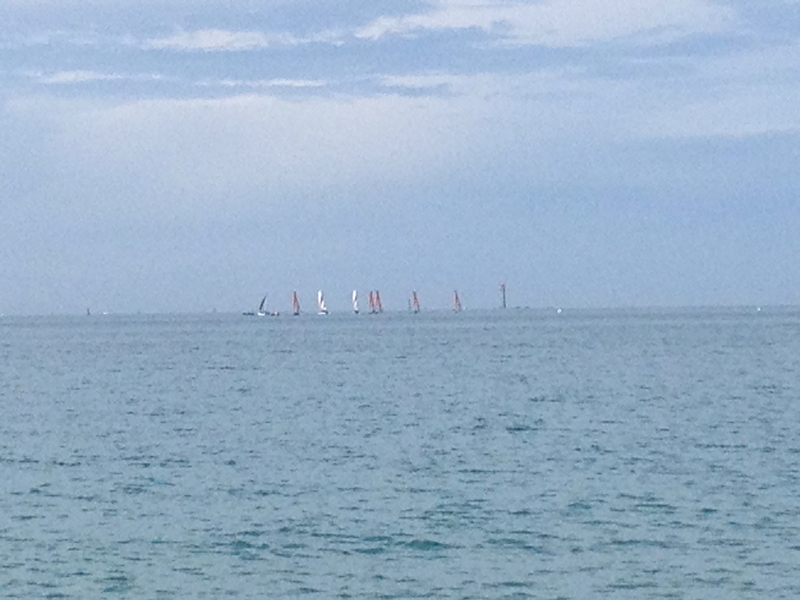 There were quite a few sail boats out today, but they were pretty far out from shore, so we did not get a good look at them. After the beach excursion we headed back to the apartment, but first, as usual, we stopped to buy a newspaper at the tabac/presse. At the apartment, we found that the post person had delivered a small package from Amazon.fr. It contained a French language exercise book which we can use in our studies. last couple of weeks. Always interesting. Just before dinner, we got another surprise. Our friend who lives on the 5th floor, is coming over from Paris tonight. It was a last-minute decision, but we will be glad to see him. But we will not see him tonight. His train will not arrive until after 23:15 / 11:15PM, so we will see him in the morning.